NTM Motors for a quad. The seem to have a decent thrust to weight ratio and support up to five cell lipos. They seem legit anyone tried one? I can't say about that one, but I have a 5060 NTM 2,600 watt that is definitely legit. I used NTM 3530-1100KV for my best quad build and like them but I do not believe the claim that every motor is hand tested unless each tester has different criteria when testing because like certain esc's the design seems to change without notice or warning and the consistency between units is not good, IMHO. I am currently testing the GFORCE motors from Value Hobby which "so far" seem much better made and are about the same price as the NTM series from Hobby King. Love my NTM 1800Kv in my speedy plane. Makes it hit about 100MPH on 4S. Runs like a champ. Worth every penny IMO. So a NTM 28-30S 800kv http://www.hobbyking.com/hobbyking/...00W_Brushless_Motor_short_shaft_version_.html would probably be a decent choice for this frame ? Of course with the accessory kit to mount props. 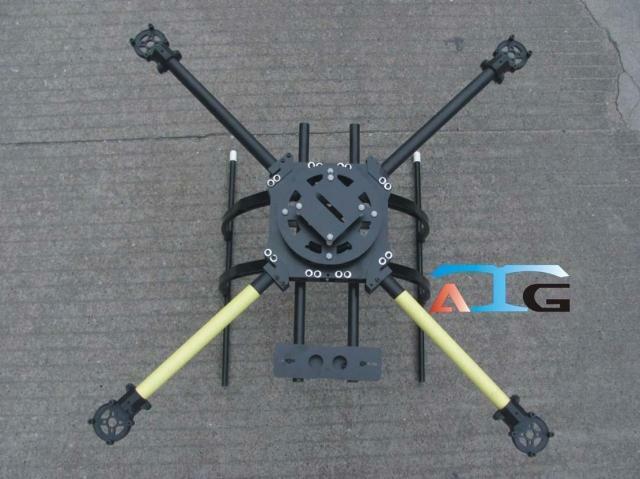 Looks like the frame supports up to 14 inch props so it is probably pretty big. My 650 has Detrum motors of almost identical specs and 11.5 inch props. I really wish I had used larger motors. It flies fine, but struggles with any type of gear. What size are you thinking? Like a 35-30 or bigger? Looks like there are higher wattage 27 series too. However it looks like the larger ones do not support 5 cells???? I haven't decided what I want to do. I want to use 3cell batteries because I have dozens of them. If I stay with three cell, I will use Power Up 480 Plus motors from Heads Up. I've had great luck with those on 3cells. Otherwise I'll just buy more 4 cell batteries and stick with the smaller motors. I guess it really depends on what batteries you're planning to use. Always have the option of two 3S in a series for higher voltage applications. I'm not sure the 18 amp esc's could handle 6cell? Usually not if it has a BEC incorporated into the ESC. Many Opto ESC's can handle higher voltage though. So for a quad with a gimbal and say a gopro or a slr which motor would you all recommend from the Hobbyking site? BIG Frame and 15" props. For a DSLR I would not fly anything but a Hex or Octo If it is an expensive one. IMHO and YMMV. Almost anything will lift a GoPro. The 850 supports 4s and seems to have impressive lift. I dont know about efficiency or if there is a reason everyone uses the NTMs or others instead. I have some 700s which seem nice but I am forever having to tighten the props. I guess no one uses the DT850. I noticed the dt series are cheaper what is the advantage over the NTMs or other more expensive ones? The DT series are cheap, powerful and reliable workhorses. I've purchased 12 of them so far, never had an issue. But there are two things that MUST be done. . .or you'll most likely have issues sooner or later. 1 - Do not clamp the prop against the bell. 2- Epoxy the wire leads coming off the stator. Yeh i followed the flitetest tri guide and clamped them against the bell with a shim. When I found out that you are suppose to sandwich them between two nuts it was too late and the shaft was too short. Now I have them zipped to the motor holes.